How do I use call barring to block calls to certain destinations? Can I allow other people to modify hunt group settings? Why has an extension or hunt group been locked due to "repeated login failures"? 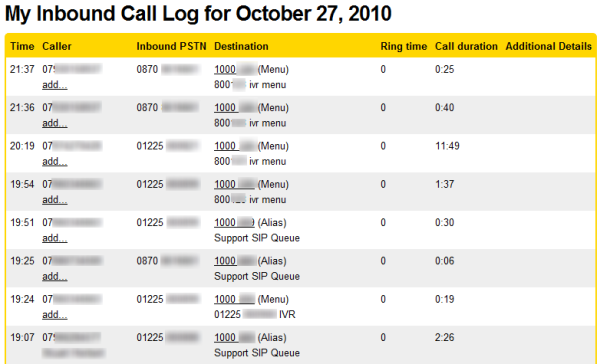 Gradwell VoIP users can see full call records for both inbound and outbound calls. This guide will help introduce you to working with these records. Details of calls received can be found in your VoIP control panel, simply click on Calls In from the top menu. This provides a daily summary of inbound calls. Clicking any of the entries will show you all the calls received on that date, including the caller's phone number if available. Other information that you'll see here includes the phone number that was dialled, and the internal destination (such as an extension or voice menu) that dialling this number led to. From here you can also add numbers directly to your Gradwell directory. The Gradwell directory in your control panel allows you to keep a phone book in your control panel. If you receive a call from a number in your directory a compatible IP phone will display the name that you saved for that contact. The name will also be displayed in these call lists, making it easier to identify who incoming calls were from. To add numbers to the directory, simply click add... and enter a name for the contact. If you want to produce a call log for a date range, click the download range in csv format link at the top of the Calls In page. This allows you to select a start and end date, and a phone number to produce inbound call logs for. The information will be downloaded automatically as a CSV file which can be opened in a spreadsheet program such as Microsoft Excel or Open Office. answered? : Was the call was answered? You can view details of all calls that your organisation has received by clicking on Calls Out in the top hand menu of your control panel. The default view is to see a daily summary of all calls made, along with the duration and cost (please note that this is for guidance only, please refer to your invoice for actual amounts charged). There are also monthly totals further down the page under Invoiced Calls Overview. Clicking any of these entries will show you which extensions made calls, the caller ID used, and the destination. You can add the destination numbers to your control panel directory using the add... link to make identifying the destinations easier. The summary link from the daily entries will show you a summary of each extension, how many calls they made, the total duration and cost. Finally, if you want to download data to work with in a spreadsheet program (such as Microsoft Office or Open Office) you can use the download or txt links. Once you have your data in a spreadsheet, you can begin to work on it. You may already have software that you can input raw data into, and you should refer to the user documentation for your specific program. If you don't have any specific software, you can always use a pivot table to make sense of the data. Pivot tables are excellent for summarising large lists of data. They are also highly customisable, allowing you to filter and edit them after they have been created. If you have never used a pivot table before, they can initially seem difficult to understand. However, once you start using them you should find they are really easy to use but also powerful. 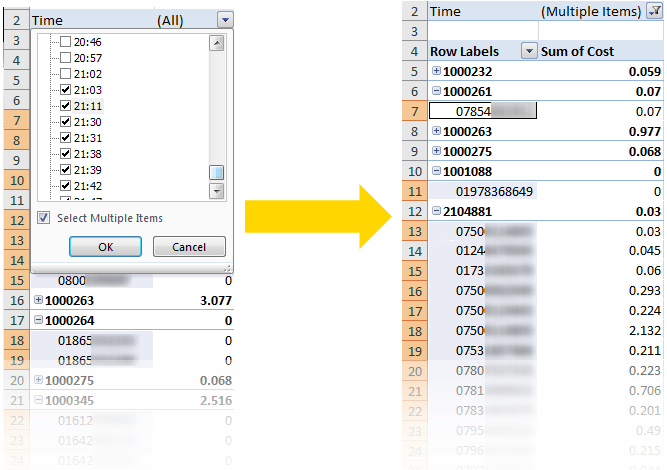 To use a pivot table, you should ask what information you are trying to find. For example, let's say "we want to see the cost of outbound calls for each extension". For this we've downloaded the calls out record for a month. As you can see from the raw data on the left, we can't answer this question from the unsorted list. You could manually sort the columns, however this would take an extremely long time. Let's create the pivot table instead. The instructions below are for Microsoft Excel 2007, however the steps should be similar for other programs. Select the date you want to use in the table (including the headers on the top line). 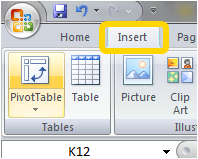 Then click Insert from the top menu and then PivotTable. You will be asked to confirm what data you want to use, as you have already selected it you can just press OK.
You can now start creating your pivot table. On the right hand side a side panel will appear that allows you to customise the table. You add fields to the table using the top Choose fields to add to report section. 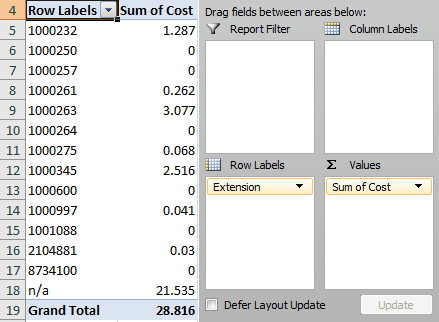 You don't have to use all the fields - this is one of the reasons pivot tables are so flexible. For example, in this table we won't use the CallType field. To make some sense of all of this, we need to answer our question "we want to see the cost of outbound calls for each extension". 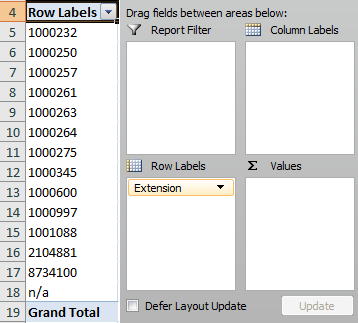 The simplest way to do this would be to drag the Extension field to the Row Labels area. This would sort all the different extensions into separate rows. We also wanted to work out the sum of the cost for each extension. 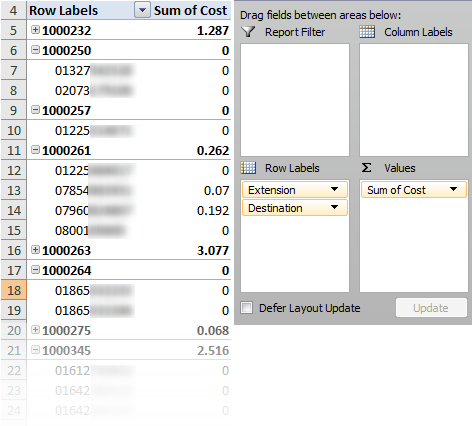 To do this, drag the Cost field to the Values area. This adds all the costs up and displays it alongside each extension. 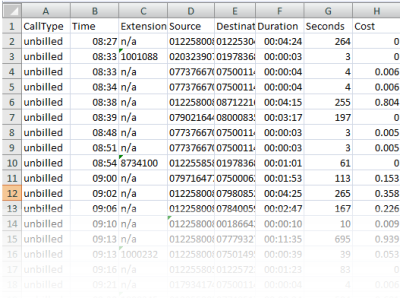 That is a very simple pivot table, allowing you to take a huge list of information and summarise it in under a minute. If you wanted to filter even further, you could click the down arrow next to Row Labels and select which extensions to show. This helps if you want to summarise the data even further. Now let's assume that we want to do a bit more with our pivot table. What if you also wanted to see who each extension was calling? All you need to do is add the Destination field to the Row Labels area. The pivot table will automatically collate all the dialled destinations neatly under each extension, along with the cost breakdown. Now we're beginning to form a complex, yet simple to read table. Now let's assume that you wanted to check who was using the phone after work hours. For that we need a filter. Drag the Time field to the Report filter area. This adds it to the top of your table, but initially doesn't change anything because it is set to 'all'. To filter, click the down arrow and select the times you want to filter. 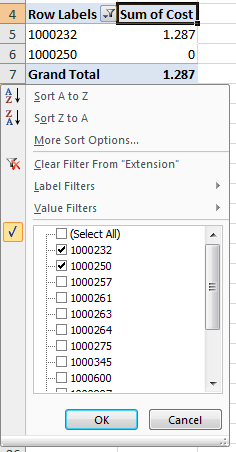 The pivot table will automatically update to only show you the data you have chosen to filter. This is just a few ways that you can use pivot tables to manage your call records. To tailor a table exactly to your needs simply make a note of what information you want to get from the table, select your data and play around until you've got it right! To learn more about working with pivot tables, this online training course from Microsoft is an excellent place to get started. How do I use Email-to-Fax?